This is Pepsi. He is an adult tuxedo cat and I love him. Pepsi has a bit of a story. He was born in Wales and lived on a farm with his other brothers and sisters. A family from around my area liked the look of him ( I don't blame them) so took him and his sister, Stella, home. The cats grew up together and eventually moved multiple times around my area. Then his family had children. Now there's something you should now about Pepsi, he is a very independent and reserved cat who doesn't like fuss or loud noises. So with the arrival of new screaming babies, Pepsi soon moved himself out. He lost friendship with his sister and decided to go on travels. This was about 7 years ago. A family in my neighbourhood lost their cat and asked everyone to check there gardens. I was young when I shouted my dad and told him that there was a cat in our garden and it could possibly be the lost cat. He grabbed the cat and brought it into the house, only for it to find an escape and we never saw it again. That cat didn't turn out to be the lost cat. That cat turned out to be Pepsi. 1 year later a handsome young cat appeared at our door step and we frequently feed it and it slowly became fond of us and would hesitantly settle down in the house. 'Felix' is the name he was given until a few weeks later we found out that another couple down the street had been feeding him. We then found out his name was Pepsi. We discovered his family, his back story and his sweet little sister. His sister is very shy and won't often be near Pepsi any more. One thing that we have never been too sure of is his age. 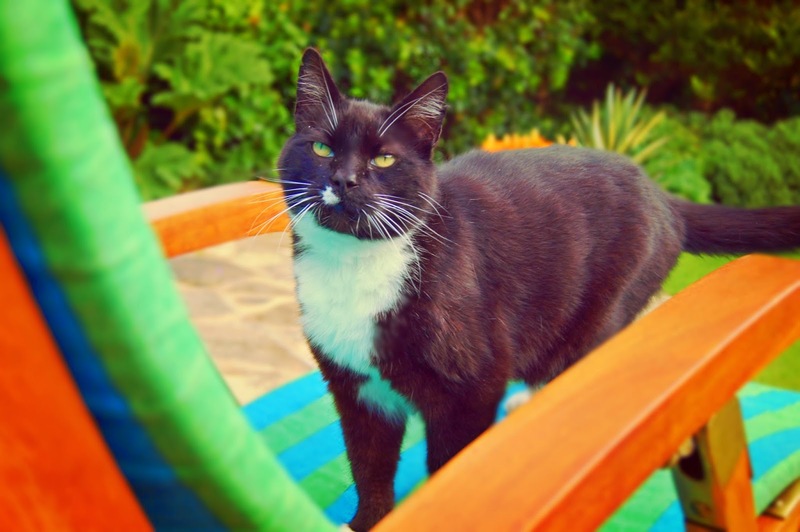 Pepsi carried on visiting our home until he eventually became a permanent resident. Both previous owners accepted our ownership of him and moved on. He is officially ours. Two summers ago, Pepsi went through a tough time in the sun and was diagnosed with a heart murmur. He over-heats and breaths heavily so we have to keep an eye on him. He's coping very, very well and he continues his cheeky ways. In our house, we take the term 'on your feet - lose your seat' very liberally because, as you can see in the image above, he will sit in our seat, on the deck chairs, on the sofa, on a bed, on a table or even on the car but he doesn't really like sitting on your lap. With Pepsi you follow his rules, he doesn't follow yours. He will wriggle and squirm in your arms but he loves nothing more than a big cuddle when he's relaxed or bored. He doesn't play with toys but he'll catch anything. He's a fighter and gets into the wars but he is the boss of this neighbourhood. My cat is the most mind blowing animal I've ever had because I could watch how inquisitive he acts all day. I've known him be loved by people that don't even like cats. Because he's not in your face or sharp-clawed. He's probably more likely to stare at you, rub himself against you, then 'meow' for food. This is Pepsi and he is the cheekiest, funniest, grumpiest, neatest, fatest, cutest cat that I have the privilege of loving. Show appreciation for your pets or favourite animals in the comments. What a sweety! My dog Toby was diagnosed with a heart murmur at 6 years old, and lived on another 12 years! They called it a 'Dicky Ticker' and scowled at me and my dad when we giggled ... Great post! I love this post (and Pepsi) so much-it's like reading a story-Great post Alice!